One of New Zealand’s most celebrated artists, Frances Hodgkins spent most of her life overseas. During a professional career that spanned 56 years, she earned a place among the British avant-garde of the 1930s and 1940s – the first New Zealand-born artist to achieve such stature. Born in Dunedin in 1869, Hodgkins went to Europe for the first time in 1901. Prior to her departure, she had focused on familiar and domestic settings, working mainly in portraiture − placing models in casual outdoor settings, surrounded by shrubbery or still life. 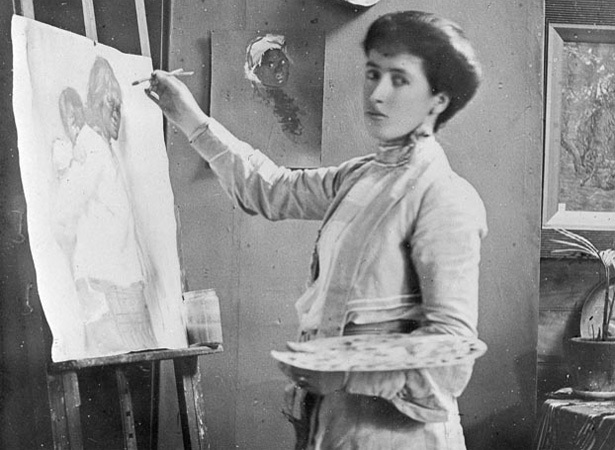 In 1903 she became the first New Zealand artist to exhibit at the Royal Academy of Arts. By the 1920s she was well-established on the British art scene. In 1929 she became associated with the Seven and Five Society, exhibiting alongside leading British avant-garde artists such as Barbara Hepworth, Ben Nicholson and Henry Moore. She began to combine the landscape and still-life genres in her work. Urns and jugs filled with bouquets of flowers and patterned tablecloths set in the foreground of a landscape became popular subjects. The late 1930s were a highly productive period for the increasingly confident Hodgkins. By the early 1940s she had held four major solo shows and participated in about 30 group shows in Britain and abroad. She was one of a small group of artists chosen to represent Britain at the Venice Biennale in 1940. Frances Hodgkins died in a psychiatric hospital in Dorset in May 1947. Her ashes were returned to New Zealand and placed in the family plot in Waikanae cemetery, north of Wellington. We have 7 biographies, 2 articles, related to Death of Frances Hodgkins.